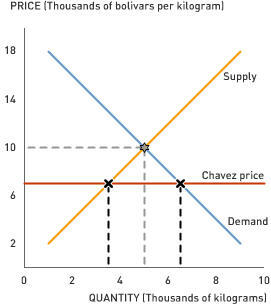 Aplia Econ Blog: News for Economics Students: Chavez: Can't Regulate? Expropriate. Hugo Chavez, Venezuela's president, set lofty goals for regulating the coffee market--keep prices low for consumers and ensure farmers get a high price for their coffee beans. On the surface, Chavez appears to be making all the right political moves: helping poor coffee farmers and reaching voters where it counts--through their coffee mugs. But, as you've learned in your econ class, government attempts to control prices usually end in turmoil. The coffee market hasn't behaved according to Chavez's plans. His solution: send in the National Guard. Apparently, an under-caffeinated population is a matter of national security. Read on to find out more about Venezuela's coffee chaos. 1. How are coffee producers--the companies that roast and process coffee beans--getting squeezed by President Chavez's price controls? How did the coffee producers respond to the price controls? 2. Chavez sets both the prices coffee producers pay to farmers and the prices coffee producers receive from consumers. Is the regulated price that producers pay to farmers an example of a price floor or a price ceiling? What about the price producers receive from consumers? 3. Chavez implements price controls on a variety of foodstuffs in Venezuela, including powdered milk and maize. What consequences do the price controls have in Venezuelan supermarkets? 4. How do you think coffee producers will respond to the government's coffee expropriation? 5. Chavez threatened to nationalize the coffee industry. Coffee producers often incur a loss after selling their coffee under current price controls. Assuming the government would incur the same costs as private coffee producers, who would make up for the government's loss on coffee production?